Today we meet Thomas Product, 25 years old, born in Geneva, physicist by profession and head of the refereeing at the Nations Cup. He discovered Tchoukball in Geneva in 2006. In addition to being a a tchoukball player, he started volunteering very early on. He was a member of the Tchoukball Club Geneva committee for 4 years, before leaving to study in Zurich. Interested and competent in refereeing, he quickly climbed the various levels and has been an international referee since 2016. Member of the refereeing committee of Swiss Tchoukball in recent years, he took over its lead this summer. When did you first participate to the TGI as a player? Thomas Product (T.P. ): I participated to the Tchoukball Geneva Indoors for the first time in 2007 in the M15 category, when I was 14 years old. What is your best memory as players? (T.P. ): In 2011, we won the final against Austria. This match was special because I played at home and it was the first time I participated in a tournament as a member of the Swiss adult team. Since a few years you are heavily invested in the management of refereeing, how did you find yourself having so much responsibility, be it at the level of Swiss Tchoukball or the TGI? (T.P. ): I have always been interested in refereeing and the Referee Commission of Swiss Tchoukball has always been open to new members. For the TGI, I was in contact with Daniel Buschbeck and that’s how it was done. It is now 3 years since you have been responsible for the referees of the TGI. What are your goals so that the event is managed in the best way by the refereeing body? (T.P. ): My first goal is to have enough referees to cover the event, especially non-playing referees, who are dedicated solely to refereeing. Secondly, we often forget that a good game of Tchoukball goes through a well refereed game, my goal is therefore that the referees are even more aware of the importance of their role. How would you like the TGI to evolve over the next few years? (TP): As far as arbitration is concerned, I want to increase the number of referees who are non-players and competent, whose sole contribution to the success of the TGI is their refereeing, but this at a top level. More generally, I dream of a much greater media coverage for our event. With the TGI the matches are each year filmed in a more and more professional way, what are the implications for the refereeing? (T.P. ): Just like the players, the actions of the referees will be seen and can be reviewed. It is important for them to be aware of it and to behave even more professionally than today. The fact that the games are filmed with a pro quality also allows us to review situations, discuss them and thus further improve the quality of the refereeing. Do the referees prepare differently when they must referee games of the TGI in which there is a large audience and full stands? (T.P. ): Yes, when you’re refereeing an important game, you face the same issues as the players. It seems important to me to prepare well mentally and you have to immerse yourself in the atmosphere. How do you see the refereeing evolving in elite tchoukball in the next few years? (T.P. ): I really see professionalisation, because refereeing requires special skills that need to be worked on regularly. Which is less and less compatible with playing Tchoukball at the same time. Do you think that in the future electronic means, like the Tennis challenge or the VAR in football will be used in Tchoukball? (T.P. ): No, I see more of referees. In my opinion, Tchoukball would be slowed down too much by these technological means that would not be effective. If we compare to basketball, which is a sport where the referee is very little challenged, they use very little technological means, but they are many referees per game. What do you think of the current level of arbitration in major world competitions like the TGI? (T.P. ): At the TGI, I am generally very satisfied with the level of the referees, but I think that we can do a lot better. For each edition we try to do better than the previous one. This is how we have reached the current level and that is how we intend to continue to improve. Refereeeing is not necessarily the activity that attracts the most people, what is your plan of action to try to change attitudes and motivate new people to train to become a referee? (T.P. ): I realise that there is respect for the function of referee. But as for the player, a referee learns continuously and the first match refereed is never a World Cup final. To motivate new people in this adventure I have two priorities: the first is to communicate about the function of referee, to show the attraction of refereeing and that it is an activity that is practiced in a team. The second is to train as many people as possible, already from the junior categories, to create referee vocations as soon as possible. What would you say to someone to motivate them to become a volunteer in the TGI staff? (T.P. ): Through this event you experience an out of the ordinary event, and you are close to the players and enjoy the pleasures of the field. What would you say to a stranger who does not know Tchoukball, to convince him to follow the TGI? (T.P. ): If he wants to see an extraordinary sport, Tchoukball is one. 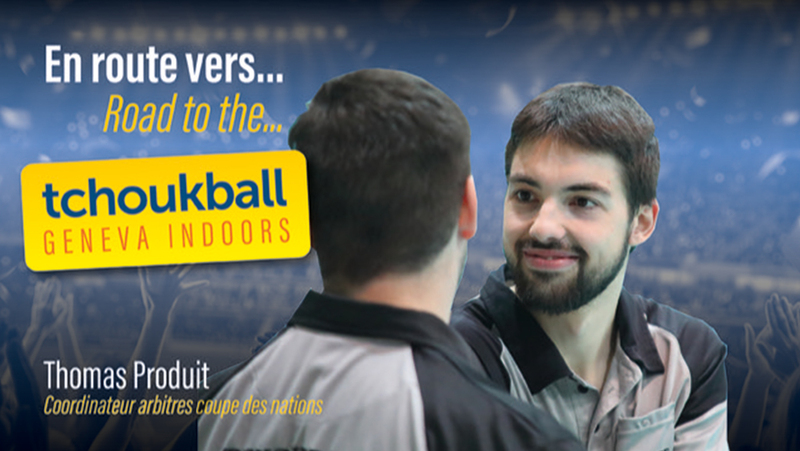 And the Tchoukball Geneva Indoors are an opportunity to see the best players in the circuit in action.